We've been collecting information for over a week now to gain a deeper understanding of the seafloor in the Cayman Trough. Today Tim, our sonar geophysicist, answers some questions on bathymetry. Tim, what exactly is bathymetry? It's the science of measuring ocean depths, used for mapping the seafloor.The shape of the seafloor can help to explain what is happening in the Earth's oceans. We can learn about the environment and get an indication of the types of habitat in a particular area, though not the actual biology. And we can determine the type of seafloor surface in terms of the rock, sand and mud. Tim, what did the seafloor map of the Cayman Trough look like before we started this expedition? We really did not have much in the way of a detailed map, the resolution - level of detail - being to about one kilometre. But knowing the little we did, we hypothesised that there were deep-sea vents. And when you're looking for a vent field that may cover only a few metres, one kilometre granularity of mapping is not enough. Tim, what tools do you use to map the seafloor? We use a number of tools: the shipboard multibeam echo-sounder, TOBI (Towed Ocean Bottom Instrument), the CTD (Conductivity, Temperature and Depth), and the Autosub6000's multibeam. The information collected from each of these tools helps to create a three-dimensional map of the seafloor. Tim, how does TOBI help? TOBI gives us a high-resolution data and is able to cover large areas. From this we are able to interpret the geological processes that have shaped the area. Tim, how does Autosub6000 help? 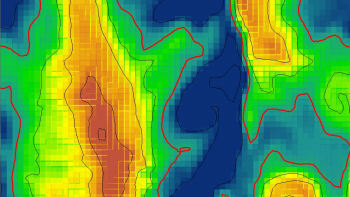 Using the Autosub6000's multibeam sonar, we can collect details of the seafloor down to one metre resolution. The ship's multibeam system is useful, but in these depths it gives us a much lower resolution, because it is further away from the sea bed. 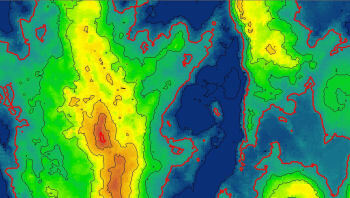 The quality of the signal from multibeam is dependent on the amount of water the sonar has to travel through - less water provides a higher quality map. The multibeam on Autosub6000 gives us higher resolution signals, because it is so close to the sea floor. We also look at the ship's navigation systems, such as GPS (Global Positioning System) - from this we can plot the position of our instruments when they were collecting information, then add this to the three-dimensional map.